There are new movement controls for citrus canker after detection in Northern Territory and Western Australia. The Queensland Department of Agriculture and Fisheries has issued a new movement control order (MCO) notice for citrus canker and carriers to prevent it spreading into Queensland after it was recently detected in the Northern Territory and Western Australia. The MCO will allow for trade of citrus fruits from registered businesses that are within a Northern Territory or Western Australia citrus canker control area from 26 June 2018. The MCO restricts the movement of plants and plant material (including fruit) from the citrus family (Rutaceae) and associated planting media and soil, machinery or equipment into Queensland unless they meet the conditions outlined. The MCO will stay in effect for three months unless revoked earlier. See revocation of the previous citrus canker movement control order. All Australian states have implemented movement restrictions and are revising entry conditions to allow for trade of citrus fruits from registered businesses that are within a Northern Territory or Western Australia citrus canker control area. 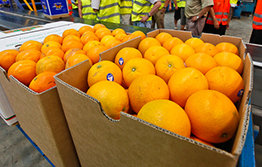 These measures are based on a Federal Government protocol to allow importation of fresh unshu mandarin fruit from Shizuoka Prefecture, Japan to Australia. Citrus canker (Xanthomonas citri pv. citri) – also known as Xanthomonas citri subsp. citri – is a contagious bacterial disease which can affect all citrus plants. The disease can be spread rapidly over short distances by wind-blown rain, weather events and human movement, particularly in tropical and subtropical climates. Infected plants display lesions which form on leaves, fruits and stems, resulting in low plant vigour and a reduction in fruit quality and quantity.